As great as a wood burning fireplace is it does have its drawbacks. For one thing is it messy to carry, stack and store the firewood. 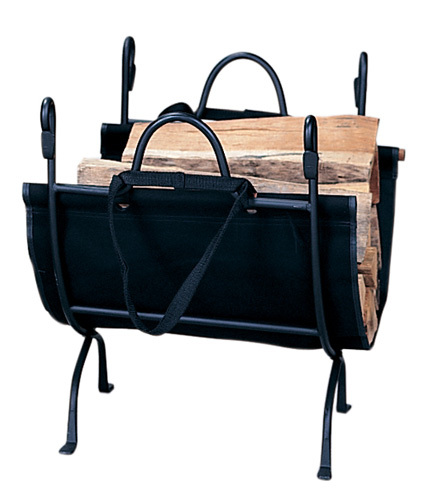 This combination wrought iron firewood holder combines with a canvas log carrier can make the whole process a lot easier. The log holder will compliment the decor of any fireplace and hearth. It will hold sufficient for an evening and will keep the wood warm and dry. The carrier will fit right into the holder. Good to have to carry in more wood than you can with only your hands. Saves trips out into the cold. I have decided that making the decision to purchase this item has become one of the best choices that I have ever made. It is quite sturdy, holds a lot of wood, and looks beautiful. We decided to purchase this item as a gift for my sister and brother in law and so far it has provided one year of excellent service. It looks terrific right next to the fireplace as well keeps the wood in a convenient location. After searching around, I decided to settle on this as a gift for my sister and brother in law. They live in Georgia and as a result do not have that great of a need for their fireplace. As a result, they now have a place where they can store enough firewood for any extended cold snap. I decided one year to give this as a Christmas present to my daughter. It was an excellent choice, and she has found it very easy to fold up and place into storage during the summer months. We had been looking for a rack to hold fire wood and settled on this one. We are quite happy to say that it is the perfect solution to what our party house needed. It is both safe and attractive. This is a great product that is made even more attractive by a terrific price. It has proven itself to be extremely durable and is capable of storing a large quantity of wood. This is a little flimsy, but it does posses an attractive design and a good grip.